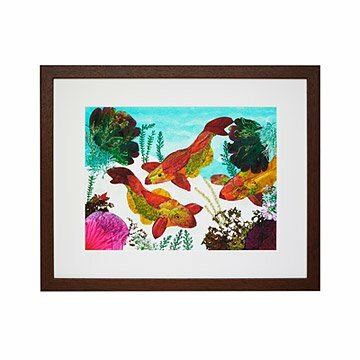 Teri Stratford creates her underwater scene from a collage of leaves and flower petals. In this mixed media work, artist Teri Stratford spins a fish tale like no other. For her underwater scene, she picked natural materials from the earth itself—her home in the Catskills, to be exact. She researched leaves and tropical plants to find those that most mimicked the look of underwater foliage, selecting individual leaves for their color or texture. Even the fish residing in her watery world draw their ruddy color from a natural spectrum of leaves. The rich detail and dimension of this collage are captured in a high-resolution print on archival paper.